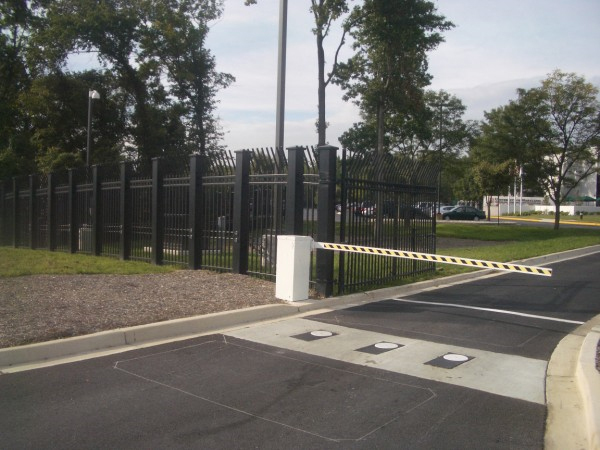 Perimeter fences are essentially any type of fence that extends around the entire perimeter of a facility. Perimeter fences can be used for residential, commercial, industrial, and government applications. Naturally, different types of fences work better for different applications. Lets talk about what types of fences work best in each situation. A perimeter fence for a residential application can be approached from several standpoints. It can be purely aesthetic in nature, allowing for intricate designs that add a nice visual element to the property. Security can also be incorporated into residential fences, without sacrificing aesthetic appeal, simply by building the fence higher. Wood fences make great perimeter fences for large, rural properties. Commercial perimeter fences can be styled to fit the environment they’re in. If it’s an upscale commercial center, ornate iron fences work well. For office buildings and complexes, more reserved yet still stately iron work can add a nice touch. Industrial perimeter fences usually are more utilitarian in nature, and opt for function over form. Chain link and vinyl chain link fences cover large areas efficiently and at an affordable price. For government applications such as high security complexes, high security fencing is the norm. This can include anything from anti-climb fencing with barbed wire, to crash rated bollards and secure gate entry systems. This entry was posted on Friday, December 13th, 2013 at 7:29 pm. Both comments and pings are currently closed.